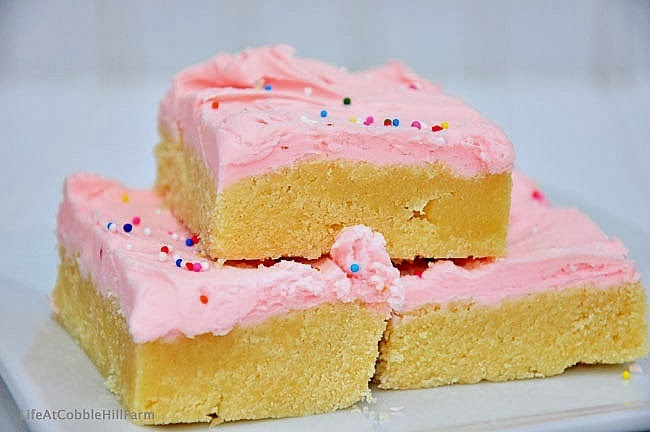 I adore sugar cookies but I'm not a fan of cutting them out, baking them, and then carefully frosting them. 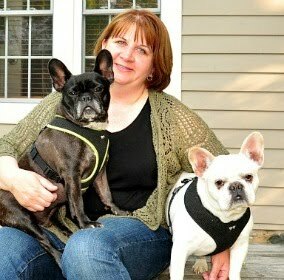 They are beautiful, I just don't like to take the time to do this. A couple of years ago, Barnes and Noble offered a Peppermint Sugar Cookie bar at the Holidays that I thought tasted pretty yummy. 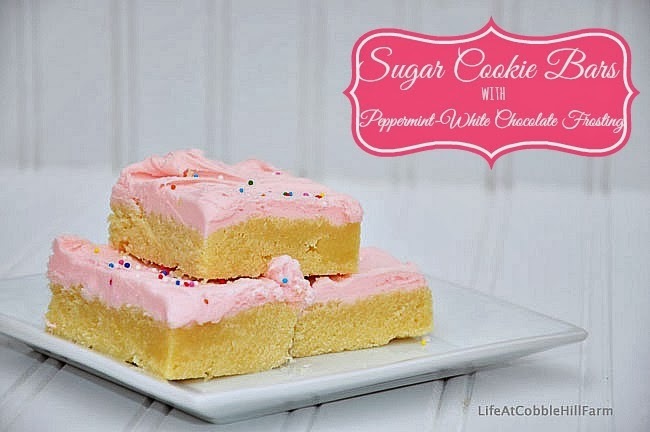 So when I came across a sugar cookie bar recipe, I knew I could recreate the tasty treat. 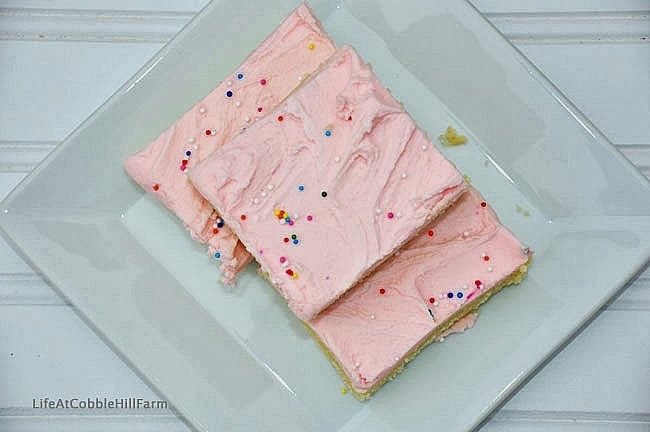 These are soft, moist, and delicious, and the best part - they are super easy. Although I don't use food coloring typically in our food, I did so for photography purposes. Preheat oven to 375 degrees. Prepare baking dish by buttering a 13" x 9" baking dish, set aside. In a small bowl combine flour, baking powder and salt, set aside. In the bowl of an electric mixer, whip together butter and sugar until pale and fluffy about 3-4 minutes. Stir in egg and egg white. Add sour cream and vanilla and mix until blended. Slowly add dry mixture and stir until well combine. With buttered hands, gently press (so gently almost patting) mixture into buttered baking dish. Bake 17 - 20 minutes until toothpick inserted into the center comes out clean and edges are lightly golden. Cool completely, then frost and cut into squares. In a mixing bowl with an electric mixer, whip together butter, melted white chocolate, powdered sugar and half and half until fluffy. Blend in vanilla and peppermint extracts as well as food coloring, if using. Oh my, these look amazing!! Yum!! They are so pretty! I love the light pink color. This is a great alternative to cutting out cookies which not everyone has time for. Oh my goodness, brilliant! I also am not a fan of cutting out cookies, so I usually do a drop cookies and frost them. But this takes another step off of that. mmm. Successfully cutting out cookies is the reason I don't make cookies unless they are drop or rolling-out-a-ball-and-flattening-them types of cookies. I may try these. These are so pretty! I love anything with white chocolate. Those are so pretty and look beyond delicious and also time saving. 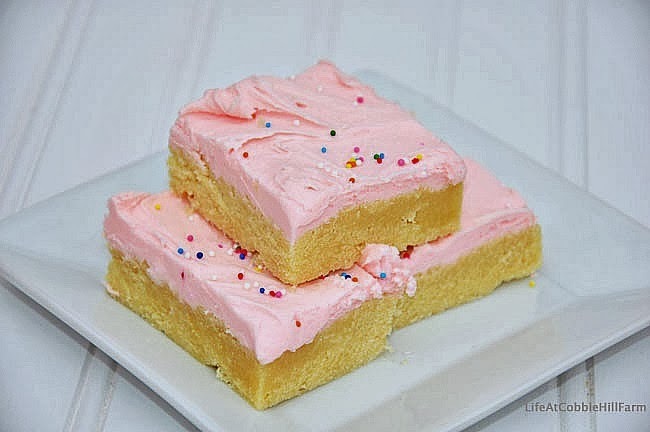 So ganna make these!